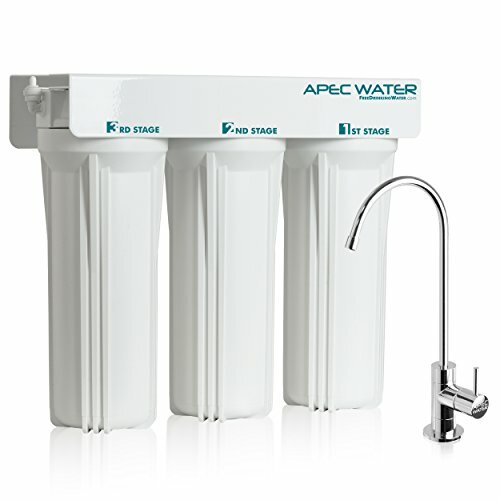 The apec 3 stage water filtration system delivers clean filtered water at an affordable price. This complete 3-stage water filter system is made from high caliber components to offer long-lasting, reliable performance. The three premium quality filters lasts over 12 months for fewer filter change outs and high performance. Designed and built in the USA, the system provides a continuous on demand Supply of quality filtered water directly to your tap. • 1St stage: high-grade 10 inch high-capacity polypropylene sediment filter -removes dust, particles, and rust. 100% pure polypropylene depth filter with exceptional dirt-holding capacity translates to longer life and fewer change-outs than existing string-wound or resin-bonded filters. • 2Nd stage: premium extruded carbon block 10 inch -gets rid of unpleasant chlorine, tastes, odors, cloudiness and colors. Also removes VOCs and other common chemicals from the water. • 3RD stage: premium extruded carbon block 10 inch - further removes chlorine, tastes, odors, and other common chemicals from the water to provide great filtered water. Super capacity filters guaranteeing to remove chemicals, taste and odors.